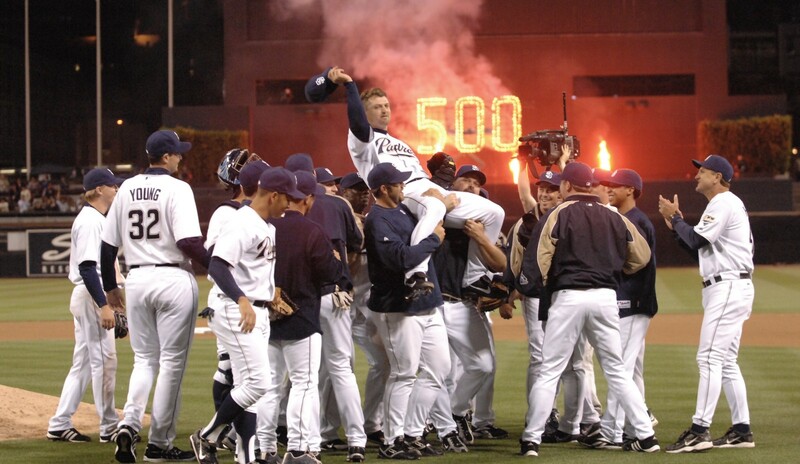 Even though 2007 ended in an incredibly bittersweet way (Game 163, ugh! ), I still think of that season with fond memories. One of the best moments from that season happened on June 6th, when Trevor registered his 500th career save. I love this photo and if you click on it to bring up a large version, you can pick out faces of a handful of guys that were pretty fun to watch in San Diego, such as Greg Maddux, Chris Young, David Wells, Heath Bell, Mike Cameron, etc. Speaking of Heath Bell, I hope I’m not the only person who hopes he eventually gets the recognition he deserves as Trevor’s successor and just overall being an awesome Padre. I honestly think he should be inducted into the team Hall of Fame at some point. While looking at this timeline of Trevor Hoffman’s career, I noticed that Trevor’s first save as a Padre took place on August 6th, 1993. The date rang a bell and then I realized that I attended this game. It was the day that Tony Gwynn got his 2000th career hit during a doubleheader against the Rockies. With that said, Trevor got his save in game #1 and Tony got his hit in game #2. The only memory I have of Trevor that day is him coming out and the bill of his cap being bent down low in an intimidating fashion. It was quite the fitting look for a relief pitcher. Something that I’ve always thought is cool is that Trevor had 4 hits during his career, with 2 of them being doubles. Yes, his career average was .118, but the fact that the former shortstop was able to get a pair of extra base hits is pretty awesome. I have searched high and low for video/photos of any of his Padres hits but always come up empty. All I can ever find is this video of his final career at-bat, which came during his time with the Brewers in 2010. 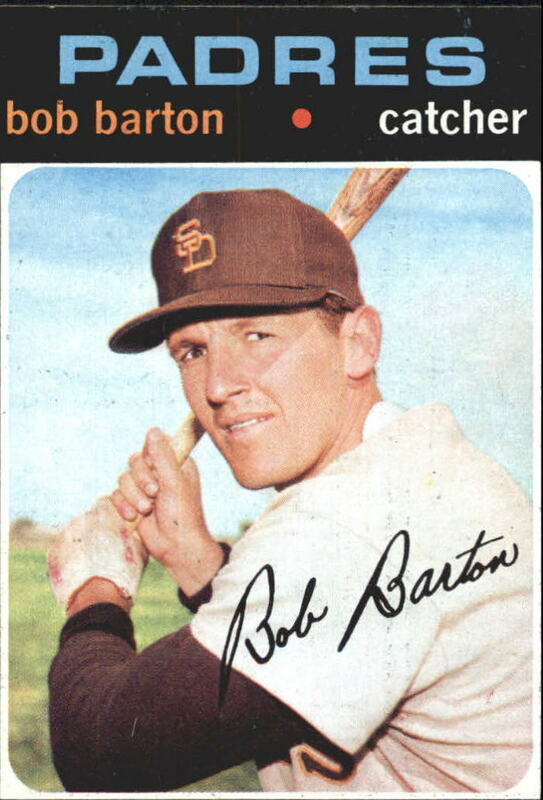 A few days ago, I read that former Padres catcher, Bob Barton recently passed away. To be honest, I can’t say that I knew anything about Barker besides seeing his name on old team rosters. After reading up on him, I discovered that Barton played for the Padres on two different occasions, from 1970-1972, and then again in 1974. In addition, according to Jeff Sanders at the Union-Tribune, Barton was the team player representative in 1972, which is notable because it was the year of the first player’s strike in MLB history. His best statistical year as a hitter was as a starter for the 1971 Padres; in 121 games, he hit .250 with five home runs and 23 runs batted in along with 17 doubles. On defense, in 1971 he led National League catchers in runners caught stealing (42), percentage of runners caught stealing (51.2%) and errors committed (15) and was second in assists (67). Even with the 15 errors, that’s an incredibly solid season for a catcher from that era. I tip my cap to you, Bob Barton. May you rest in peace. Photos of Ted Williams with the Padres are hard to come by and the ones that do exist are usually just him posing for cameras. This photo of the Splendid Splinter taking a pitch is easily my favorite photo of him in the Pacific Coast League. 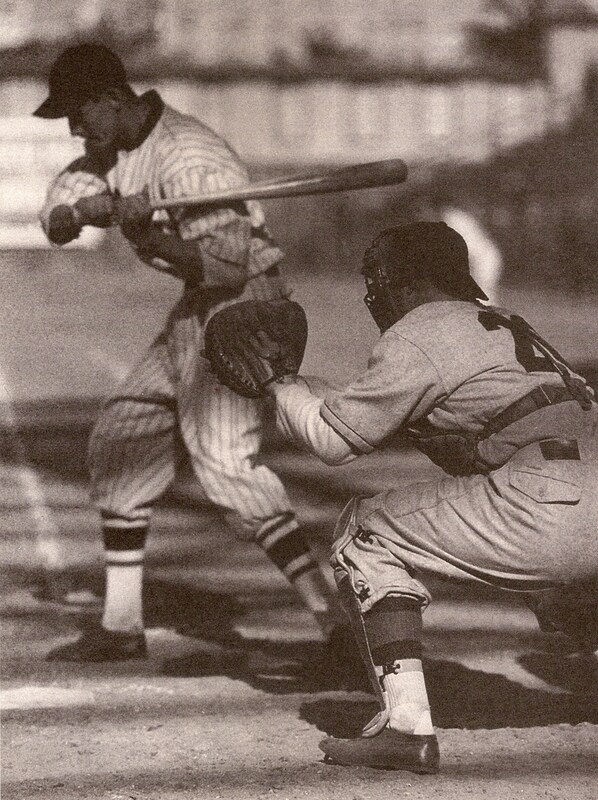 A decent quality photo of in-game action from the 1930s?? This is the stuff gets my nerdy baseball juices flowing!